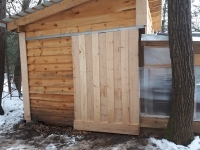 This is a custom barn door that I built for our combination greenhouse / shed. 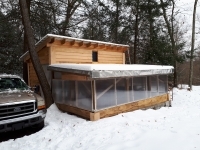 My wife and I designed this greenhouse with Pocono winters in mind - a few feet of snow on the roof, sub-zero temperatures, etc. It’s a SOLID, well built structure. Now that we've had our first snow, photo proof! This came down as around 10 inches of heavy, wet snow.